Praise! God is blessing Dr. Richard’s two-week, four-country trip in Asia. Our Global Proclamation Associates event is in less than two weeks. Please pray. Pray for the right publishing relationship for Dr. Richard’s products. 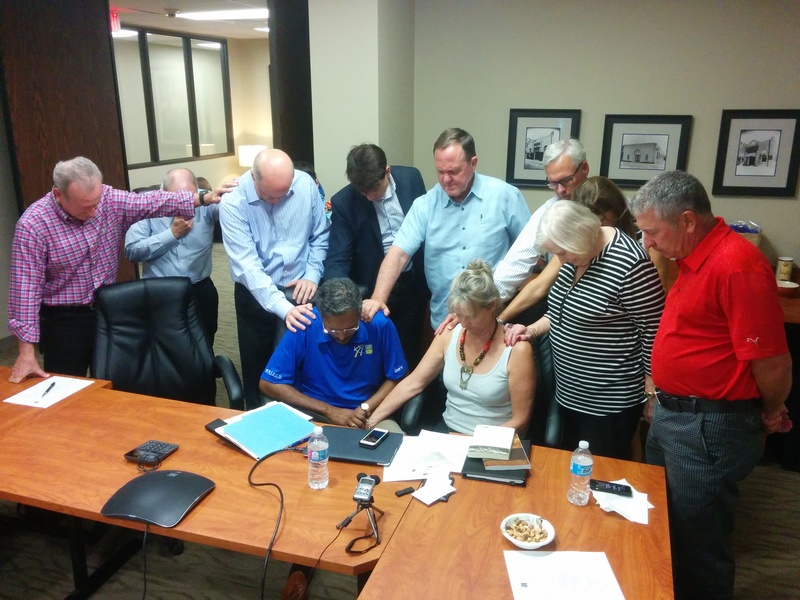 Uphold our preparation for the 2019 Dallas and national Global Proclamation Academies. Dr. Ramesh Richard and Pastor J, 2006 Dallas GPA Philippines delegate and Global Proclamation Commission team member, participated in the recent GProCommission Church Multiply Vision Festa in Japan. Attendees expressed great appreciation for RREACH taking the risk to begin a multiplication movement in 2016 with the Global Proclamation Congress for Pastoral Trainers. Dr. Richard has had an eventful trip in Asia. Thank you for praying! At a major gathering for pre-Christian opinion leaders last Saturday, 200 Christian marketplace professionals brought 350 colleagues/friends/family to hear about the Lord Jesus. Dr. Richard’s talk concluded the day-long event. Praise God for 38 individuals who embraced the Lord Jesus as their one and only God and Savior! Sixty-four expressed spiritual need and wanted to know more, and 99 percent of those who responded indicated interest in attending future similar events. Rejoice, and pray for the Holy Spirit’s continuing work. Dr. Richard hopes to maximize time on this trip to prepare for the upcoming GProAssociates event. Please ask the Lord for strong and strategic, creative and comprehensive thinking. Pray for all the pastors planning to come from 27 countries. Pray for those unable to get visas in time to attend. Thank God for His sovereignty and pray that we will trust His love through this. We would appreciate prayer for guidance as we consider partnerships with publishers for Dr. Richard’s writing projects. Ask for Dr. Richard’s materials to be made available where they can best be used to strengthen the body of Christ. So far, we have received 60 applications and conducted 22 applicant interviews for the 2019 Dallas GPA. No pastor can just apply. Each of these young leaders must be nominated to us from a network of referees, and from those nominations we invite some to apply. Please pray for nominations of quality, qualified pastors from new and under-represented countries and for discernment of whom to invite and to accept. Pray, too, for the demanding process of scheduling and preparing for national GPAs. Thank you again for praying! Our annual highlight is the amazing Dallas GPA which absorbs our energies and energizes our activities. For three weeks, RREACH hosts this fruitful project at Dallas Theological Seminary. This year 29 pastors from 29 countries were immersed in Scripture, in classes, and in fellowship with one another. That the 2017 Dallas GPA happened was a miracle indeed. Two months prior we didn’t know if we would have enough pastoral leaders. The US visa environment had changed, and we wondered if our model of bringing fine, younger pastoral leaders to Dallas would have to be changed, too. By God’s grace I arrived safe-and-sound back home after one of the greatest experiences of my life, participating at Global Proclamation Academy in Dallas. I want to express my gratitude for your leadership and for how God has used you in my life and ministry. God used the GPA, the teaching of master coaches and the fellowship of pastors to clarify my vision and rekindle my passion for the Gospel. I am in-debt to the grace of God and pray that God will continue to make the changes He began to do in my heart that will affect, God willing, both my family and my ministry for His own glory. You know we have a 100% return rate! All have arrived in their homelands to strive on! One major memory was the Dallas GPA delegates’ Skype call with GPA Honduras (June 8 – 17). Pastoral leaders spanning the whole globe encouraged 20 younger pastoral leaders in that deprived Central American land. The connection and multiplication continues deep and wide, near and far, slowly and speedily. I had to make a quick trip to Wittenberg, Germany, where 70 global strategists (apparently, I am one) met to consider breakthrough ideas for Christ’s cause over the next 3 to 5 years. It was a relationally rich time. Best of all, RREACH emphasis was again confirmed, because almost all impactful and workable ideas in every context go through pastoral leaders. Each year at this time, RREACH assesses all our ministries and activities, strengths and weaknesses, assets and liabilities, resources and lacks. I have dedicated July to move from a year of listening and waiting to asking and receiving in view of planning and acting. Please pray for me.